Some things are best read first hand. So, I am sharing this LINK with you. I have been using vitamin D for myself and my family for the past 6 months. There are great benefits for women and mood swings plus overall heath. Do look for an oil capsule rather than a tablet. And, as with all nutritional supplements you will find a better quality at a health food store. Do check with your healthcare professional before adding any vitamins and supplements to your diet. Quinoa - the Super Food! You are probably saying: "KEE who!?" Quinoa, pronounced KEE-NWAH, is truly a super food. I discovered this mighty little grain about a year ago. Recently I have had to adopt a glutten-free diet. Although short term, the diet has added to my kitchen creativity! In fact it is considered a "complete protein" as it contains all 8 essential amino acids necessary for our bodies growth and repair, including lysine. Most grains do not contain any lysine (a protein normally only found in meat, fish and eggs). Lysine also helps in the production of collagen, the protein needed for strong bones and cartilage. 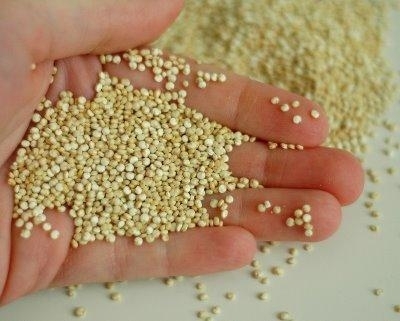 Also, quinoa is a high-fibre source of phosphorus, iron, magnesium, vitamin E and several B vitamins. Easy to digest, quinoa truly is a superfood!